Vietnamese Stir Fry Rice Noodles with Beef (Pho Xao Thit Bo) is a delicious dish with tender and flavorful beef and soft rice noodles. Everything comes together in just 15-20 minutes! An excellent quick and easy dish for everyday meals! Pho must be the most well-known Vietnamese dish in the world. I sometimes wonder why pho noodle soup has become so famous while we also have a gazillion of other delicious noodle dishes in Vietnam. Don’t get me wrong, I love pho and people in my country also love pho. We are really happy to see the success of pho abroad. It’s great to see that people from different cultures with different tastes also enjoy a steamy bowl of pho with rich and hearty broth, soft noodles and tender beef (or chicken) just like us. Besides noodle soup, pho can also be stir-fried and the dish, which is called “pho xao“, is also popular in Vietnam. It is much quicker and more simple to make than traditional pho soup. A plate of stir-fried pho can be put together in just 15 – 20 minutes. A typical stir-fried pho with beef in Vietnam contains pho (of course), beef and yu choy sum. 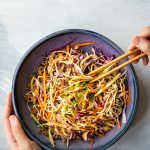 The yu choy sum in the U.S. is not as tender as the yu choy sum in Vietnam but I have found that baby bok choy is an awesome substitute since it can stay crisp-tender in this stir fry rice noodles dish. 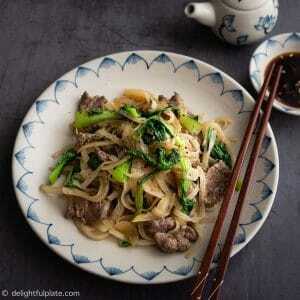 To make pho xao thit bo, you will need Vietnamese rice noodles (pho), beef and vegetables. I love to use onions and baby boy choy. You can also use your other favorite veggies such as carrots. 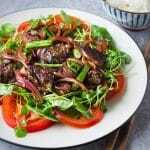 We will need to stir fry the beef and vegetables separately, and then all ingredients will be stir-fried together in the very last minute so that nothing is under or overcooked. Also make sure your pan is hot all the time, otherwise you will be steaming your ingredients instead of stir-frying them. Detailed instructions are in the recipe card. 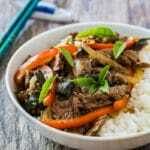 Note: I explained the tips for stir frying beef in this post Stir-fried beef with red bell pepper and basil. 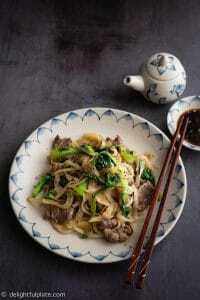 Vietnamese Stir Fry Rice Noodles with Beef (Pho Xao Thit Bo) is a delicious and easy dish with tender and flavorful beef and soft rice noodles. Everything comes together in just 15-20 minutes! Cook dried pho noodle according to package instructions but take it out 1 minute earlier than what is recommended in the instructions. Run it through cold water thoroughly, then set aside. Thinly slice the beef and marinate with 1/4 teaspoon of salt, garlic, oyster sauce and freshly cracked black pepper. Mix together fish sauce, soy sauce, water (or beef stock) and cornstarch to make the sauce. Set aside. Trim off the top and bottom of the onion, peel, cut in half and then thinly slice. Cut baby boy chop into shorter pieces. If the stems are large, slice in half lengthwise. Put a pan over medium high heat. When it's hot, add some oil and the beef. Let the beef cooked undisturbed for about 30 seconds and then start stir-frying. When it is about 80% cooked, transfer to a plate. Add a little more oil to the pan and then add onions and baby boy choy. Quickly stir fry to soften them. Add rice noodles and beef back to the pan and the sauce. Stir fry and mix well until everything is fully cooked. Adjust seasoning to taste and sprinkle with more black pepper. Transfer to clean plates and serve immediately. For 2 people, I use about 3.5-4 oz (100-120 grams) dried pho noodles. If you use more or less noodles, adjust the seasonings accordingly.